Buckles Blog: Roman Schmitt and "Toomai"
Tumi001.82, originally uploaded by bucklesw1. Any idea what year this is? Didn't Circus World fold in 1986? Is this male known by another name? I took this photo back in 1982 and two weeks later to the day, Tooomai downed Roman as he was walking him from the barn to the paddock. Roman was gored through the leg and he ended up selling him to Gary Jacobson in 1984. Before arriving at Circus World, Toomai lived at the San Diego Wild Animal Park. If he did have another name, it was before he arrived at the park. Toomai died late '84 or early '85, I met Gary at the Los Angeles Zoo in late Dec. of '84 and he was still alive then. 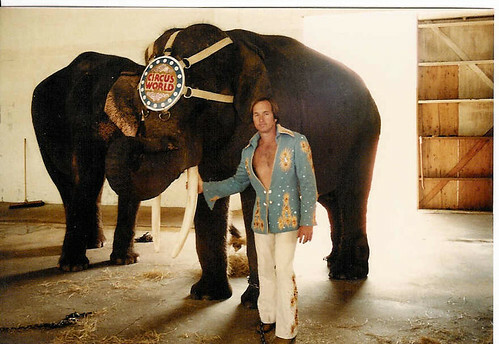 In 1980 someone in Circus World management had a San Diego Zoo connection and brought in Franz Tisch to take over the elephants. Some time later, to the delight of the Zoo Officials, they unloaded two dangerous elephants on Circus World, "Toomai" and "Chocolate". Realizing their mistake both were gotten rid of. "Toomai" to Jacobson and "Chocolate" to the Lowrey Park Zoo (another mistake). Hey Wayne, thats my dad in the pic, did you ever work with him? Chocolate was hard already in Kolmarden in Sweden, where she arrived in 1966, and although she never killed anyone, she caused accidents, which was the reason for the decision to sell her. There was also a tale she had killed someone on a circus before coming to Kolmarden. But I dont understand the part that she arrived from San Diego, becasue as far as I know she came directly from sweden to Ringling, either to one of the units or to Circus World? B.t.w, Franz Tisch had worked Chocolate in Kolmarden, before he went to Copenhagen in abt 1970. Does anyone know if Franz living, and where he can be reached? Unfortunately I did not work for your Father, although I was hoping to work for him during my three weeks holidays back in ’85. I first met your Dad back in ’82 after meeting your uncle Eddie while he was working his Tiger act at for Gee Gee at Parc Safari in Quebec and he told me to look up your Dad. I had been in touch with your Dad by visits and by phone calls over the years and was hoping to spend my holidays working for him, but unfortunately when I arrived at Circus World, he told me that he had been told due to insurance restrictions, I would not be able to work for free. So for the next three weeks, I photographed and took notes on 144 Elephants and spent time with Gee Gee (a base I had since back in ’82), Buckles, Rex, Freddie, Ted and several others! I always enjoyed my time with your Dad and have this photo on my wall of fame in my basement along with a photo your uncle gave me! How is your uncle doing and what is he now doing? I just happened across this. I worked for Roman at Circus World from November of 1983 until Spring of '85. Roman had already been inured and early in my tenure wasn't seen often. While I was there five babies were born including Ken, Barbie, and Targa. I don't remember the name of Molla's baby and I don't remember who the fifth mother was. Vance was father to all though he was sometimes called another name. I don't recall what it was. Anyway this brought back memories and I wanted to leave a comment. Not many people were at the park the morning Roman was gored.Park was failing and staff was cut down to barest minimum...hense Roman by himself moving a breeding herd of elephants by himself. Those who were there, have passed away before this internet stuff came to be.I' do like to share what happened that morning. A lot of things have been mixed up about the elephant herd owned by circus world,that Roman was awarded in the law suit. He did own a little African, and Bierka the Asian his father bought as a little punk around 1975, Hugo pick her up at Ralph Schappacher's in Bradenton. Jackie Rinehart and I delivered the two new Asian import females on our way the Ralph's for winter, in with our horses. I worked at circus world trick riding and working my high school horse act in the wild westshow, also took over and retrained the circus world Arabian liberty horse act for the circus spec. I knew Roman and Jean, and Eddie, as I lived across from them in the back yard. One morning at around seven am, Don Anderson, White Horse Troop owner/performer and I were standing in the horse barn chatting when we heard the blood curdling scream of the enraged Toomei...I knew there was a tradgedy unfolding at the elephant compound, across the sugar sand area several hundred feet between wild west horse barn and the elephant compound. I ran as hard and fast as I could, there in front of me was Roman, reaching to the work horse groom who was in front him, say " help me" . I never slowed down, and lifted Roman up with my arms under his arm pits and lifted his feet off the ground and gently layed him down on his back without bending his legs... Roman passed out as soon as he was on the ground, his head in my lap, he quit breathing. By that time the security guard on duty was there asking what happened, I told him go call an ambulance. But only Don and I and the girl from the work horse barn, and the owner of the work horses were there that morning when Roman was bringing the bulls to the elephant barn after being out all night. The head/ owner of the work horses,told me Sid was trying to do a head stand on Roman's chest while Toomai had him pinned down so Dan, I think was his name, picked up a PVC pipe and he got in the walk through and swung it at the two elephants and yelling at them, making the two elephants step back for an instant, giving Roman time to roll under the thick steel gate,and out of reach...that's when Toomai screamed and slammed the steel gate with his trunk, the sound we heard that put me in motion...Toomai was insane with anger that Roman got away...Dan ran to the security and told them there was a problem. Vance and Hugo ( sold to Portland zoo) did not arrive to circus world till after all the females were already bred by Toomai..the first two calves were born while Roman was still in the hospital. Sid and Minyak...Minyak had her baby first, a little female they name Barbie because of Matel owners. The baby ended up getting through the walkway at the gate and in with Sid...who was throwing her against the concrete wall and gave the baby a coliflower ear.Miyak was going nuts trying all day to get over the wall toher baby....finally she was allowed in with Sid and the baby...everybody still though it was Sid's. couple nights later , Sid gave birth,Jean called me from the hospital all shook up because only one elephant guy was with the females in the compound, Jean thought Sid had Another baby...things were confusing and everyone was reeling from Roman being hurt. Anyway Jean asked me to go help the guy. It was the male baby they named Roman that was just born, Sid the mother and it was chaos with baby Roman trying to stand and screaming every time he fell and setting off the two mothers who went nuts screaming and knocking him around. We had to keep both females back to keep them from throwing the baby around, until he was steady on his feet, then they calmed down and Sid stopped trying to mash her new punk! I was at the park until it was sold 1984, got see Roman come back after the tradgedy and saw Jean step up and keep the elephant act in the show. The work horse owner at circus world, the man from Kansas who saved Roman's life that morning by scaring the two elephants back long enough to let Roman escape, his name was Danner, not Dan as that was what I could remember was Dan. His name was Dave Danner, his wife was Jane. Dave was a hero that morning, he told me he was terrified to get in the compound with those elephants, but he was brave. May Dave and Jane and Roman RIP.